Puffy eyes is an ongoing problem for me. In fact, my whole eye area is not aging well. I have always had dark circles, puffiness, and wrinkly eyelids. All of that is just getting worse as I age. I received a Patchology Energizing Eye Kit for review purposes. All opinions are my own. Is it just me or do we all look a lot better in the summer? This winter is really doing a number on me. I am a person who requires sunlight. My reflection looks like I am battling some sort of terminal illness, and I feel like crap all of the time. For some strange reason, I forget to take care of my eye area. In the frigid temps, I make sure to apply lotion to my skin, but seem to skip the eye creams. Not sure why, but it was apparent that my puffy eyes needed some TLC! I received the Patchology Energizing Eye Kit, which consists of three simple steps. 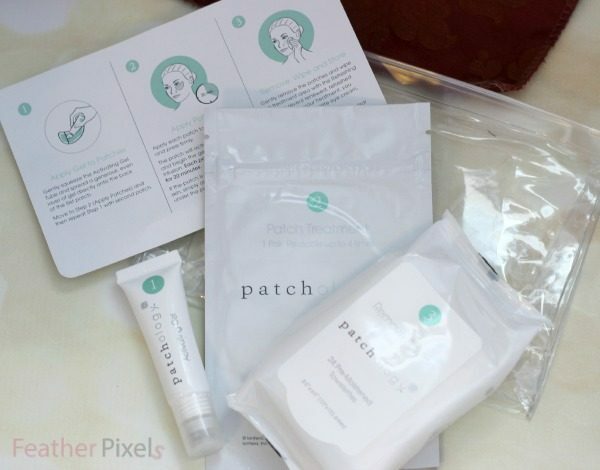 The patches use a patented micro-current technology to deliver today’s most effective ingredients to the skin. This innovative treatment penetrates deeper than regular creams and serums, providing better and faster results. Step 1: Activating Gel – After cleansing your under-eye area, apply a liberal amount of gel to the back of each eye patch. The rollerball tube allows for quick and precise application. Step 2: Patch Treatment – Once you have applied the gel, place the patch under each eye and wear for a minimum of 20 minutes. You can leave them on for up to 12 hours. 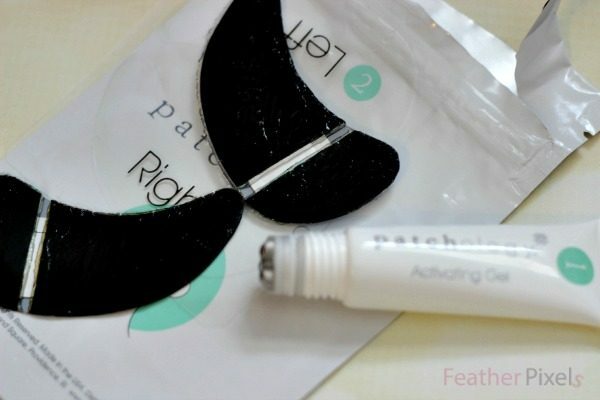 Step 3: Remove and Wipe – Gently remove the Energizing Eye Patch and use the Patchology Refreshing Wipes to remove any remaining Activating Gel Residue. Once you remove the patches, you can place them back onto the packaging they came in. Each patch can be used up to four times. I was slightly nervous about trying this product. My eyes have gotten extremely sensitive lately, and it’s difficult for me to even wear makeup at times. I was pleased that wearing the patches caused zero irritation. I could feel a slight tingly sensation where the patches were, but my eyeballs were not bothered. After just one treatment, I noticed my puffy eyes were noticeably less puffy. My whole face appeared brighter, proving how important the eye area is. I will definitely continue to use these patches and will remember not to neglect my eye area anymore. Available at Neiman Marcus, Patchology, and Bergdorf Goodman. Do you have puffy eyes? Any tips to de-puff them? I learned that you can significantly reduce eye puffiness by using these patches. The patches reduce the look dramatically of crows feet and dark circles. This is RIGHT Up my alley! the gel is not a post-treatment formula. It was developed specifically as the first step of every micro-current patch treatment. I have horrible dark circles and if this truly works for puffiness and dark circles I am in! The reviews really make me want to try the Patchology Energizing Eye Kit! I have a real problem with under eye bags and puffiness and I love that you can see a difference in as little as 20 minutes! I loke that you can target specific areas with the patches. I suffer from allergies and often have puffy eyes. I am excited that they are working on developing patches for other areas and skin issues, especially ones for cellulite and acne! The phrase a recharging station for your eyes caught my eye, pun intended. I’m looking forward to trying this product. It seems no matter how much rest I get I still have dark circles and puffy eyes. The reviews that other users of this product have left make me really want to try it. I feel like I always look exhausted. If this worked I would use it often! I could really use these, getting rid of the puffiness is impossible! When I don’t get enough sleep I have the worst bags. I would love some relief. I need something like this to refresh and energize my tired and puffy looking eyes. This looks amazing! I love that they have free shipping and a money back guarantee! I have horrible bags under my eyes, so this would be an amazing tool in my beauty arsenal! I truly didn’t realize that wine, salt and sugar could be the reason my bags are worse some days! WOW! I need these!! First time I seen this but it’s perfect. I also like that you can reuse them up to 4 times. However, I really like that you can see the results after for a more healthier look. 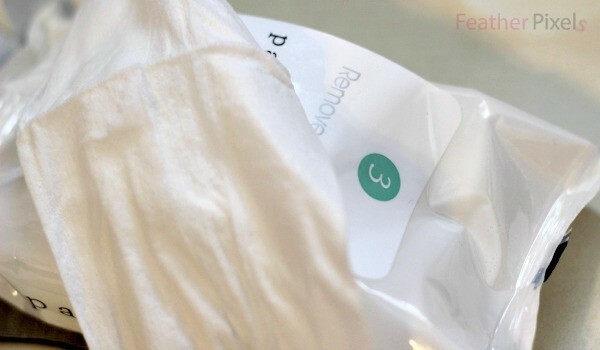 Perfect for a mom with little sleep! I learned that Patches represent a fundamentally better way to treat key skin concerns with their proven ability to deliver a targeted boost of ingredients for faster, more noticeable and longer-lasting results. I would like to try these, since I have puffy eyes. Puffiness under my eyes is an area I definitely need help with! I like the idea of a “re-charging station” for the eyes! I never knew that micro-current patches were so much more effective than topical creams. Very helpful information. Oh wow!! This is exactly what I need. I recently had my 3rd boy. The sleepless nights are pilling up. I sure could use these!! If these educe puffiness under your eyes as well as fine lines I NEED this product. I like that it is concentrated by the patch. I’m only 23 and have horrible eyebags. No matter what i do they are still there! I LEARNED THAT Patches have been used for centuries to deliver a targeted concentration of ingredients for optimal treatment of a variety of conditions. I love that Rachel Ray uses them. I also love the fact that they are going to expand into other areas like for wrinkles and acne! Wow, it says each patch may be re-used up to 4 times. That is pretty cool. I would love to try it for the lines around my eyes. I wake up every morning with dark circles under my eyes everyday. I would love to have them gone. I liked: With regular use they will also help diminish the look of fine lines and wrinkles.. I love how the patches deliver a concentrated dose to the area of your skin that needs it the most. I never thought of treating your skin with patches. But it makes send that you can treat specific areas. Undereye bags have become the bane of my existence. There are plenty of products out there that do a half way decent job of covering dark circles, spots and other discoloration. But the puffiness makes me look and feel at leas 10 years older! I do appreciate your helpful and informative review (and generous giveaway!) I will definitely be giving them a try next week. I’ll be thrilled if if works as good for me as it does for you. I’ve tried all kinds of eye care products but never found anything that really helps with the puffiness problem (except for cucumber slices which actually DO help a little! I would love to try this. My under eye area has always been a challenge and is only getting worse as I get older. Great review and thanks for the giveaway. Great looking site! Easy to use and find what you want! I would like to win i have really bad puffy eyes and dark sircles under my eye i have heard really good feviews about this product would definitely love to give them a try!! I learned that you can purchased at Neimans. This is a Product My Poor eyes could really use! I learned and liked that you are also provided with Refreshing Wipes to cleanse the treated area. I also like that it is a 20 minute treatment, this is not as long as I thought it would be! I learned that patch therapy like this is an ancient Chinese technique. I think this would definitely be worth trying to get rid of the puffiness. I love this idea! Im just getting the first hints of wrinkles under my eyes so finding out about these is timely. the before and after photos look promising! I think that it’s great that this product works in just 20 minutes to reveal smoother, healthier looking skin. It’s one thing to feel very tired in the morning, but I hate looking tired. Even when I think I get a good nights sleep, my eyes are still puffy. never knew that micro-current patches were so much more effective than topical creams. Oh wow! I have yet to find a product to work on my puffy eyes!! I keep trying all kinds of things but nothing seems to make the difference. I learned that this is a more powerful product for puffiness and wrinkles than most and boy do I need that! I’d love to try these. I learned that there are no side effects or allergic reactions associated with the Energizing Eye Patch! I’d love to try these out! I like that they’re reusable; I’ve only ever used disposable eye patches before, and they felt a lot cheaper (and wasteful). I read lots of reviews on this product, and it’s gotten lots of 5 stars. Even Rachel Ray loves it! I think that is pretty cool. I’d love to try it, to see if it’ll get rid of my puffy eyes, which stress has really done a number on lately. I’m glad the patches aren’t one use. I should pay more attention to my eyes especially because I tend to skip my eye cream. This kit sounds incredible! I definitely need to try this! Thanks for the tip! I’m 40- and just started to notice signs of aging but my eyes, like you described have always been a trouble area. I try all kinds of creams and serums with hardly any noticeable results. This sounds like something I definitely want to try, it’s completely different. Thank you for the ‘find ‘!